When the 2nd World War started the army of United Kingdom had a lack of all types of weapons. After the Great War they dreamed about “No more wars”. They even put their rifles on the streets and let their tanks run over them. The senoir military, who always prefer to prepare for the past war instead of the next, were quite satisfied with their Lee Enfield rifles who were very fast to shoot with, although not as fast as an automatic rifle or a submachine gun. BSA Co Ltd. had developed a modification of the Thompson Submachine gun in 1926 in calibre 9x20 mm, but the British army did not show much interest in submachine guns until after the war started. BSA 1926 Thompson, Weight 4 kg, 9x20 mm, 500 r.p.m., Thompson mags. Above details of a BSA Co. Ltd 1926 by John T. Thompson. The submachine guns of the Commando units. As stated before - When the 2nd World War started the army of United Kingdom had a lack of all types of weapons. On the 4th of June 1940, Winston Churchill wrote to General Ismay in the War Cabinet Secretariat concerning the need to start a new unit to combat the German Blitz Krieg. The British formed special commando units to carry out raids. On the 8th of June 1940, Section M09 of the War Office was brought into being. These units were called Commandos. The Commando units demanded a short effective weapon with high fire power. UK had no submachine gun at all when the war started. It became a desperate need for these submachine guns. Great Britain became the first country during the war to adopt the Thompson Submachine gun (SMG) M1928A1, quickly followed by Sweden. As mentioned above the British had already made tests with Thompson SMG:s.
In 1940 UK bought large numbers of the Thompson 1928A1 from Auto Ordnance Corp. in USA. It was the first country to use the Thompson submachine gun in a war. Thompson Submachine gun M1928A1 was used by the early Commandos here with vertical front grip and later straight wooden forend. Thompson 1928A1 was the primary submachine gun for the newly formed Commando units which were trained by the two famous captains W. E. Fairbairn and Eric Anthony “Bill” Sykes. You can read more about them in the article about the Fairbairn Sykes Fighting knife. 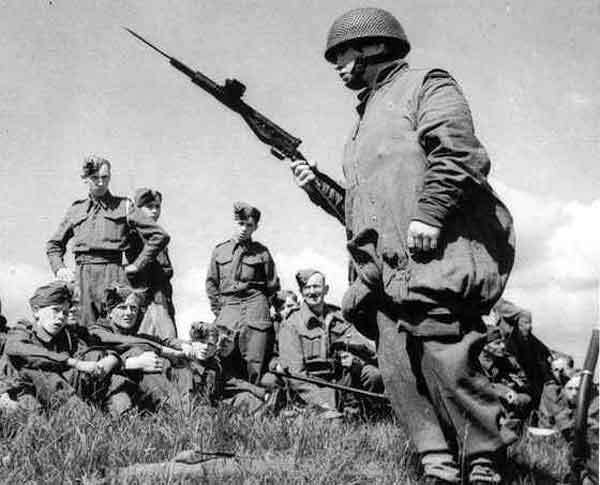 Bill Sykes was a very tough teacher with the Tommy-gun for the young Commandoes. 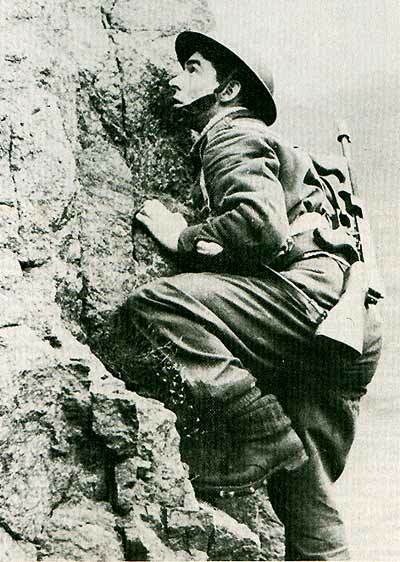 during his training in climbing a rock. 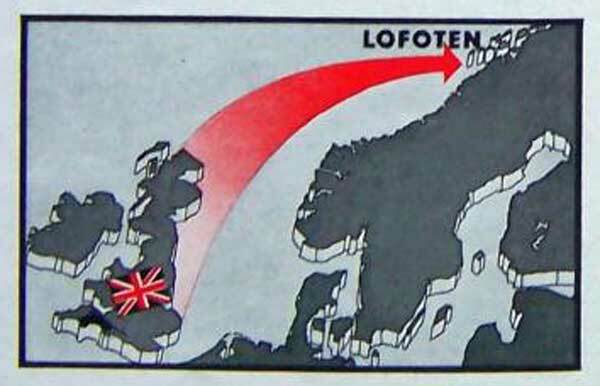 Operation Claymore was a raid on the Lofoten Islands. It was carried out on the 4th of March 1941 by British Commando and Royal Naval units on the remote islands off the coast of Norway. The raid was conducted by approximately 1000 men of No. 3 and No 4 Commando, 52 Norwegians of Norwegian Independent Company 1 and demolition teams from the 55th Field Squadron Royal Engineers. The raid was very successful. Sterling Engineering Company also made a copy of the German Bergmann MP28 II. The gun was designed by G.H. Lanchester. The selector is positioned differently compared to the Bergmann. Beside it is equipped with a bayonet. It is not very common that submachine guns are equipped with bayonets but the British wanted this equipment during the war. The Lanchester was introduced in 1941. Mk1 was a selective fire weapon but later model appeared in full auto only. It was a typical pre war submachine gun and expensive to produce. It is a very heavy and clumsy submachine gun. It was issued to the navy. The Sten gun filled the need of UK during the war for a cheap, easy made submachine gun. The Stens were made by millions by many manufacturers. BSA made 400 000 + Stens. 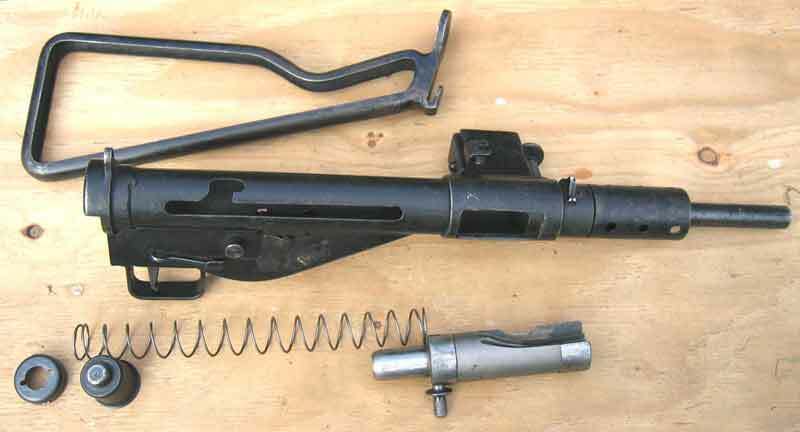 The basic Sten gun was developed at Enfield by R,V. Shepperd and H.J. Turpin. The name Sten is derived from the first letters of their names and the first two letters of Enfield. Submachine guns are very suitable to combine with silencers. The silencer for the Sten gun was first developed in 1942, and was put into action in 1943. It is known that it was used to kill the Norwegian traitor, Ivar Grande, in 1944. The Sten gun was dropped in large numbers to the partisans. It was so easy to build that only the barrels were dropped to the partisans and they then made their own Stens. The Sten was such a practical construction that even the Germans started to make these submachine guns at large numbers and equip their soldiers with them. The magazine was the weak point oft the Sten. The mags were sensitive to dirt and could not be loaded completely because of the high risk of malfunction. 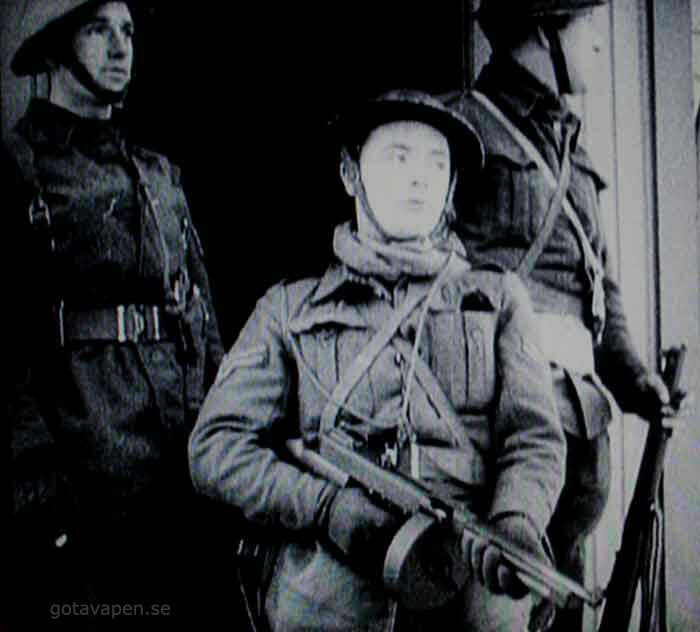 The Swedish Submachine Gun Carl Gustaf m/45 is a more exclusive copy of this gun except for the magazine. 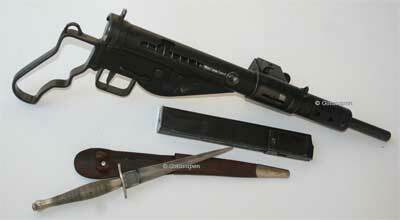 Sten Mk 2 with the very rare bayonet bayonet. 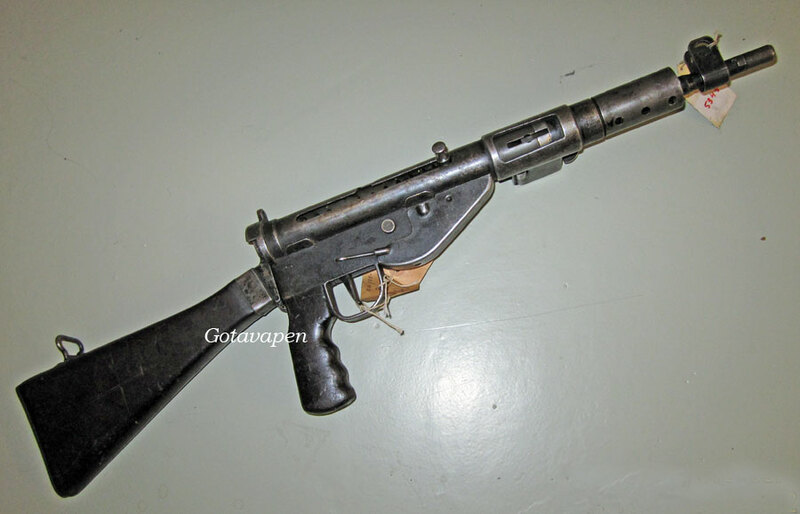 Sten SMG:s were used by many resistances movements like this one from Norway. This Sten has a very popular pistol grip instead of shoulder stock. The knife is Fairbairn-Sykes Fighting knife 1st Pattern. 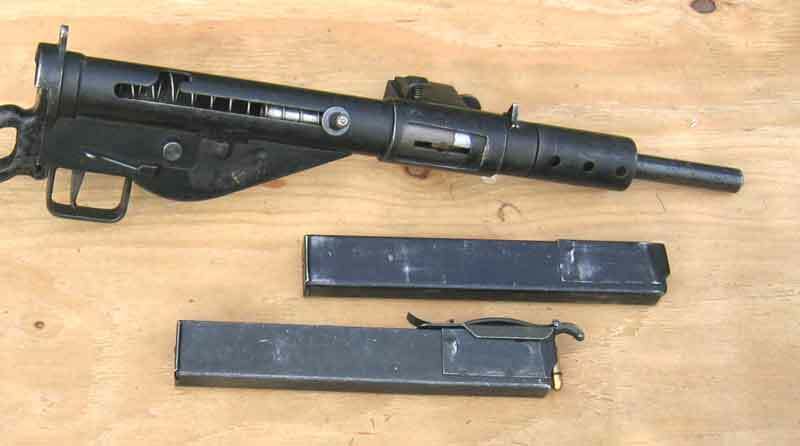 Here you can see the Sten Gun Mk 2 with its bolt removed. Here you can see how Sten Mk 2 is working. with Sten Mark 2 and bayonett. 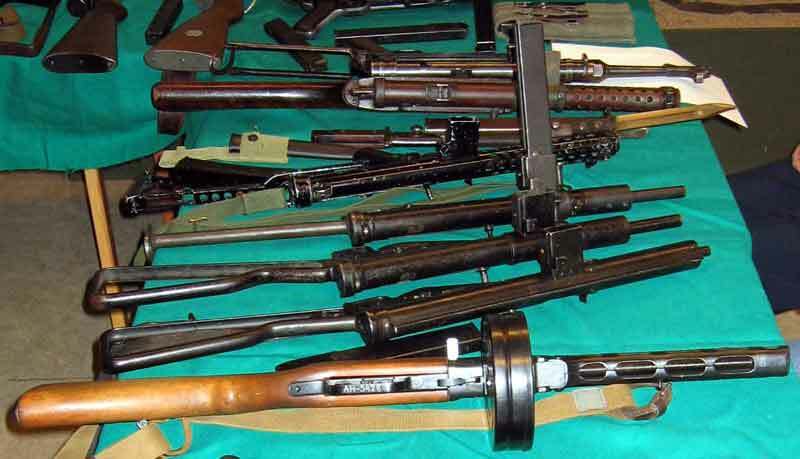 Above: Apart from the Ppsh41 in the front, some submachine guns from UK. Here is a Sterling or Patchett gun. It was developed by G.W. Patchett towards the end of WW2 at Sterling Engineering Company of Dagenham in Essex. 1951 it was adopted and delivered in 1953 as Submachine Gun L2A1. Sterling was adopted by New Zealand, Canada, India and several other countries in the Commonwealth beside from UK. There is a silenced version of this gun called L34A1.